The cover is a release sheet(cutting sheet taped on to a white die-cut cardboard cover. 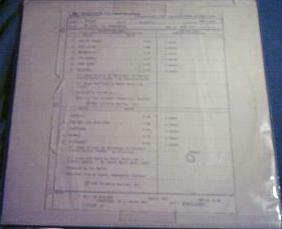 The note states mastering instructions from Bronze/Polydor to Mercury Records. It might be difficult to see on the picture but in the left top corner on the note there is a Polydor logo. The labels are white Presswell Records labels and they have, on some copies, "Motorhead side one" and "side two" handwritten on them. Presswell Records were based in Ancora, New Jersey, and normally made records for Atlantic. I have seen the same white Presswell labels on a Genesis 1974 pressing so they seems to have been used at least during 1974-1981. In May 2010 a copy was sold on Ebay. This copy had the white Presswell labels but without any handwriting. It was housed in a white cardboard sleeve with the taped mastering instructions just like previous copies. It also had a white inner. The seller atomic-hifi, located in the USA, claimed that he "stumbled across it so time ago from a collector in the UK. He had a rather extensive collection of test pressings for all types of music (jazz, funk, blues, rock, etc)". There are also PRC test pressing, which is not so strange considering there are 3 different labels for the stock copy which indicates they have used different pressing companys.